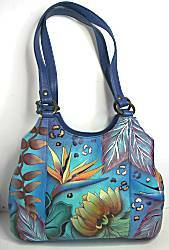 On this page we gather BLUE and AQUA BLUE jewelry and handbags! For spring and summer, and this is a beautiful splash to add to an outfit...we offer many shades of these lighter blues in handbags and jewelry. Light denim too for casual elegance. In our many years of working with customers, we find that most every gal looks good in these colors! 1-3/8 inches long on sterling earwire, 5/8 inch across. Nickel silver metal has etched spiral and feather motifs, aqua blue glass and painted finish accents. 2 inches long on sterling earwire, 7/16 inch across. A pair of gracefully curved and shaped metal pieces join into the birdwing motif. Background metal is lightly etched and colored light aqua blue, the smaller is openwork in darker azure blue, a blue glass cabochon set in the center. 2 inches long on sterling earwire, 1/2 inch across. Background metal panel is softly airbrushed from dark aqua into barely-there orchid. Darkened silver cutout overlay has bamboo motif. 2 inches long on sterling earwire, 1-1/8 inch across. Dramatic wide figure-8 shape of metal that is joined on each end with space between for bead dangle to swing. The curves have background of lime green graduating into aqua, and overlay cutout of bright blue pattern. 1-5/8 inches long on goldfill earwire, 1/2 inch across. Brass filigree panel with ovals in smooth and dotted textures, hovers above marbled dark teal teardrop. 1-3/8 inches long on sterling earwire, 3/4 inch across. 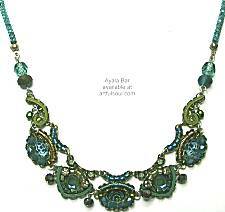 Round and slightly domed filigree metal is colored cool blue, with blue bead swinging in the open center. 1-3/4 inches long on sterling earwire, 1 inch across. Half-circle of metal has cutout geometric pattern highlighted with aqua and dark blue to look like overlapping pieces (but it is just one). Suspended like a swing from silver wire. 1-5/8 inches long on sterling earwire, 5/8 inch across. Two elongated triangles overlap, the background is marbled mediterranean sea blues and cutout scrolling design in mirror-like silver metal swings above. 1-1/2 inches long on sterling earwire, 1/2 inch across. Shield metal shape has tonal blue spiral pattern in it, repeated in large silver spiral dangle on top. 2-1/8 inches long on sterling earwire, 7/16 inch across. Curved column is graduated dark to lighter teal as it moves upward, a pale aqua-silver metal cutout overlay depicts graceful daisy stems. 1-3/4 inches long on sterling earwire, 1/2 inch across. Open teardrop in background is richly patterned in dark turquoise, on top a minty cutout piece swings easily. 1-1/2 inches long on sterling earwire, 1/2 inch across. Gunmetal filigree panel with star, sea and spiral motifs holds the turquoise howlite stone, swinging above aqua oval. 1-7/8 inches long on sterling earwire, 5/8 inch across. Loops in graduated sizes layer turquoise/teal blue, turquoise green, and seafoam, satin metal finishes. Artistic shape is quite flattering to wear, measures 11 x 9 x 4 inches on oval flat base (no feet). That's on the "short" side, the "tall" side is 2 inches taller. 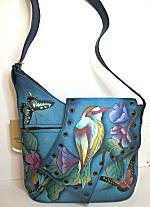 The yummy soft pebble texture leather is handpainted on background of deep turquoise/teal blue, with bird, butterflies and flowers adding colors of red, pink, green, purple, yellow, gold. Irregularly-shaped flap with antiqued brass grommets closes with a snap over a full-zipper pocket front. There is another zipper compartment on the back. But the flap is decorative, the bag is also secured inside by full inset zip top (from short end to long end). Interior lined in signature burgundy fabric, small zip pocket on one wall, 2 open pockets on the other. Adjustable 15/16 inch flat leather strap 40-45 inches long for cross-body or long shoulder wearing. Measures 10-1/2 x 8-1/2 x 5-1/4 inches in yummy soft pebble textured leather. Handpainted background of vibrant turquoise green and deep sea blue, upon which are the tropical flowers in metallic gold, copper and silver, bright orange, deep green, yellow, navy and rose. This bag is packed with organization in a satchel format! The back has zipper pocket. From the top, you have front and back full open pockets that close with center snaps to the central compartment. Between them is a full side-to-side DUAL zipper compartment. Interior lined in signature purple fabric, with 2 open pockets and zipper pocket. Comes with signature fabric eyeglass case and cosmetic pouch. Dual 20 inch straps and deep center opening for shoulder wearing. By The Artful Soul, this is part of a light blue geometrics polymer clay collection, pastel sky, washed denim, light sapphire and eggshell. Detailed handbuilt patterns are sliced and mounted onto background clay, accented with silver leaf, then fired. Light and artful. 1-7/8 inches long on surgical earwires, earrings are 1/2 inch across. Necklace has 7 clay pieces curving across 5-1/2 inches of front, 1-1/4 inch tall at center, and suspended from beads that include vintage Czech glass and seed beads. Sterling chain in back, lobster clasp, 18 inches long. 1-3/4 inch elongated triangle pin has barpin clasp to be worn at angle shown. By The Artful Soul, necklace set in mixed media polymer clay and resin. Shapes are made in golden beige polymer with embossed patterns and a sheen of golden powders. Cavities are filled with resin in pearlescent turquoise, aqua and teal colors. Necklace pendant is 2 inches long, accented with various crystals, suspended from fancy goldfill chain that is 33 inches long. Vintage glass beads and crystals adorn sections of the chain. No clasp. Earrings of the same colors dangle 1-3/4 inches long on goldfill earwires (no crystals). By The Artful Soul, this is part of a turquoise geometrics polymer clay collection, vibrant turquoise, teal, lavender and coral orange. Detailed handbuilt patterns are sliced and mounted onto background clay, accented with gold leaf, then fired. Light and artful. 2-piece earrings are 2 inches long overall, surgical post about 1/2 inch below top point. Rectangle shape dangles 2 inches long on surgical earwire, 1/2 inch across. Pendant measures 2 x 1-1/8 inches, tied onto teal blue satin cord at 27 inches long (no clasp). Pin measures 1 x 1-3/8 inches, horizontal barpin clasp to wear at angle shown. Aqua crystal framed by beads at top, curve of beads and tonal print under glass swing gently below from dual jump rings, bronze coil, and dancing fringe. Simple rhythm of mosaic shapes across front of necklace with curves of glass beads and bronze finish coils above the crystal and tonal print centers. Aqua color mesh chain on each side takes the color to back adjustable chain.